Posterior tibial tendon dysfunction (PTTD) is a common cause of adult acquired asymmetric flatfoot. Foot dysfunction leading to pain associated with this tendon injury can be debilitating and quality of life altering. Early recognition of this injury may lead to better patient outcomes. The posterior tibial tendon is one of the deep flexor muscles in the leg with origin at the proximal tibia and fibula and insertion primarily into the navicular bone of the foot. This muscle crosses three joints prior to its insertion including the ankle, subtalar and midtarsal joints with its main functional effect occurring across the midtarsal joint. The muscle is primarily active in the midstance phase of gait where is it firing just after forefoot loading to effectively stabilize the rearfoot and initiate resupination of the foot in preparation for heel lift and the transition into the swing phase of gait. Normal walking mechanics entails a smooth balance of triplanar motion of the rearfoot including pronation and supination. Foot position on the ground is influenced by pelvis and upper leg positions during gait but is strongly influence by normal muscle activity during the gait cycle. The posterior tibial tendon is the major deep muscle to help stabilize the foot by resupinating it prior to lifting the heel off of the ground. The functional overuse of this muscle in preparing for heel lift puts it at great risk for tendon injury including posterior tibial tendonitis leading to tendon rupture or attenuation. This injury generally occurs in women with greater frequency than men, fifty years of age or older, patients with a preexisting flat foot, and patients who are overweight. Clinically patients with PTTD present with the onset of pain to the medial ankle region typically without a defined history of injury or overuse. Pain is usually worse upon initial rising in the morning but tends to be progressive during the day. Medial ankle swelling may or may not be associated with PTTD. Clinically patients will present with point tenderness to palpation over the course of the posterior tibial tendon just posterior to the medial malleolus and to the level of insertion at the navicular tuberosity. 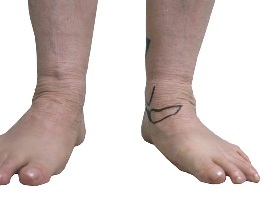 The patient will often times have a notable loss of arch height with stance when compared to the unaffected limb. Most importantly patients will often have pain to the medial ankle region if asked in the office to raise on both toes (“tip-toes”) and when asked to hold the unaffected foot off of the ground and raise on the toes of the affected foot will be unable to so. Diagnostic imaging, including plain film radiography, should be performed in weight-bearing stance position and will show positional changes in the bony architecture between the symptomatic and asymptomatic foot. MRI is an important aid in determining the extent of tendon injury and will highlight fluid within the tendon sheath noting peritendonits. Morphologic changes to the tendon in the attenuated state will be noted by flattening of the tendon and mixed “salt and pepper” appearance of the tendon when viewed on coronal sections. Early treatment includes aggressive immobilization of the lower extremity with the use of a fiberglass or removable CAM boot for 4-6 weeks followed by more supportive care including shoe, orthotic or brace management. Patients often times reach specialty offices with less acute inflammation and pain and more chronic pain with this tendon injury. The tendon attenuation that occurs will lead to permanent dysfunction of the posterior tibial tendon. Conservative care is then typically aimed at biomechanical supporting the foot with a custom orthotic to decrease the amount of pronation force on the rearfoot region. If the amount of abnormal foot pronation is severe related to the degree of tendon rupture then a traditional custom orthotic may not be an effective tool for stabilizing the rearfoot position. In this instance the use of a commercially available ankle brace from Aircast has been very helpful in relieving pain by supporting the foot. 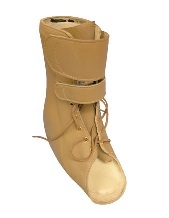 A custom gauntlet ankle brace, at times, may be needed for symptom relief prior to surgical consideration. If pain and quality of life continue despite conservative measures surgical reconstructive options can be pursued. 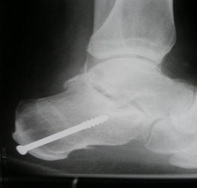 The surgical techniques that are pursued are based on the severity of the PTTD, mobility of the rearfoot joints and the degree of rearfoot arthrosis. Repair of the posterior tibial tendon attenuation with the transfer of the flexor digitorum longus (FDL) tendon is the standard primary procedure performed to improve plantarflexion inversion resistance strength of the foot. If pain and quality of life continue despite conservative measures surgical reconstructive options can be pursued. 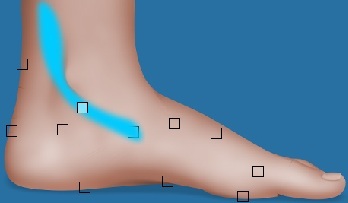 The surgical techniques that are pursued are based on the severity of the PTTD, mobility of the rearfoot joints and the degree of rearfoot arthrosis. Repair of the posterior tibial tendon attenuation with the transfer of the flexor digitorum longus tendon is the standard primary procedure performed to improve plantarflexion inversion resistance strength of the foot. The tendon repair and transfer alone does not restore foot morphology to preinjury state compared to the contralateral foot. Tendon repair alone with transfer augmentation of the FDL places the foot at great risk for recurrent flexor tendon injury or progressive rearfoot arthritis related to continued abnormal foot pronation. Adjunctive procedures include medial calcaneal displacement osteotomies, subtalar joint arthroresis, limited rearfoot arthrodesis, gastrocnemius recession and end stage triple arthrodesis for debilitating rearfoot arthritis. The development of a more rigid rearfoot with pain to palpation at the midtarsal and subtalar joints with or without supportive radiographic findings of arthritis generally supports the choice of joint destructive arthrodesis procedures. Post operative care is based on the surgical procedure pursued with general non weight bearing period of 6 weeks followed by progressive weight bearing and physical therapy with continued shoe and orthotic management. Early recognition of this tendon injury may have a profound influence as to its clinical outcome. Medial ankle pain in a patient with a preexisting flatfoot must set off a “red flag” for posterior tibial tendon dysfunction. Hindfoot motion following reconstruction for posterior tibial tendon dysfunction. A biomechanical analysis of posterior tibial tendon dysfunction, medial displacement calcaneal osteotomy and flexor digitorum longus transfer in adult acquired flat foot.